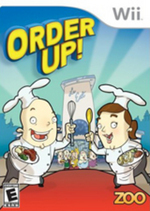 Product Description: As a promising new chef on the island of Port Abello, players of Order Up! get to build their own culinary legacy and restaurant empire from the ground up. Rising from humble beginnings as a grill cook in a fast food restaurant, the player comes to grips with dozens of different ingredients and many different cuisines, from classic American Diner food, to Mexican and Italian dishes. During this journey, players will deal with the headaches and hazards of running a working restaurant kitchen, picky patrons, quirky assistant chefs, food critics and health inspectors. Order Up! 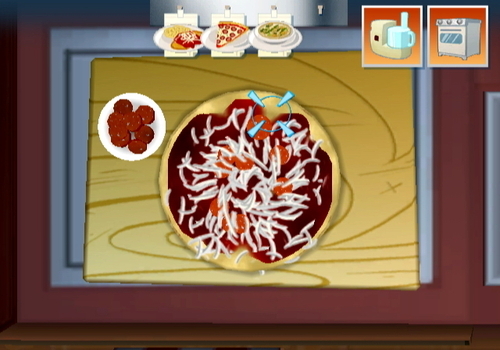 is a deep, fast paced game, full of personality, which promises to push the cooking genre to its limits. I love the Nintendo Wii but good games are generally hard to find. Although third party games for the system are generally a miss more than a hit, every now and then, one of these third party games makes it through and Order Up! is one of those games. Although Order Up! revolves around cooking, developers Zoo Games have actually created quite an engaging title that features a variety of mini-games with a healthy dose of humour to keep you glued to the screen. Chef Ramsey… it’s time to move over! Before you become a culinary master or wish to apply for the next Iron Chef, you origins in Order Up! are quite humble where you begin in a fast food restaurant which also teaches you the ropes of the game. Your teacher unfortunately doesn’t care and as you fry burgers and get food ready, you soon yearn for greater achievements. The comedy aspect of the title is great, whether it’s the annoying customers or the elements such as the “Chef Black Market” where you buy secret recipes all adds to the fun of the title. Once you have purchased all the relevant recipes for your level (whether legally or otherwise), you need to wait until the local food critics gives you the thumbs up before you can proceed to the next restaurant which includes Mexican, Italian and Haute. 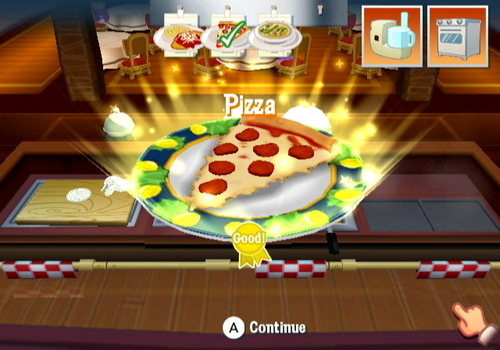 Where the title does shine is through the gameplay which is perfect on the Wii as you use the controllers to control all facets of cooking. Whether your using the controller as a knife or taking out fries from the fryer, the control system is perfect and you really immerses you into this game. Before you start criticising that the game is quite easy, as you progress, things get more complicated in the kitchen as you are doing a variety of things and this is where things get tricky, because you need to watch what you are cooking. Interesting enough, all the meal ingredients handle differently which results in varied and interesting gameplay. You also need to add spices and the like to make those meals more edible. Your dream in Order Up! is to create a five star restaurant and in order to achieve this, you need to ensure that your food is up to scratch as you are rated on your meals. Match that with the ticket system of orders and if you fall behind, your customers will get shirty and there goes your dream. As you progress, you eventually get the chance to hire assistants who can assist you in the kitchen, although they only have one area of expertise and when you have a few working for you, you need to ensure that you give them the correct jobs. 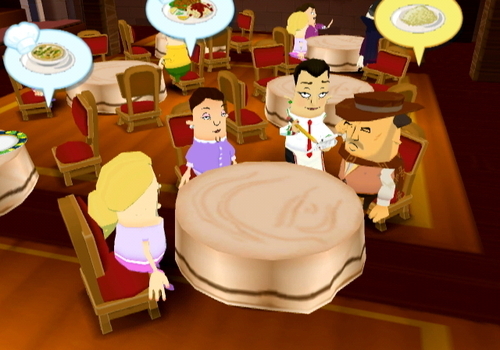 Graphically the title is impressive on the Nintendo Wii with a cartoon element to the world of Order Up! There are a variety of interesting special effects to assist with the cooking and match that with realistic cooking sounds and Order Up! is a nicely rounded game. In conclusion, Order Up! is an interesting game that uses the unique control system of the Wii perfectly. Initially the game is quite fun which does get a tad more difficult as you progress. Some of the mini-games are a little boring but in general, Order Up! has enough flare to keep you interested from start to finish. Definitely original and unique!